Humanity’s first ventures into space stirred a positive emotional response in many individuals who had no direct economic or professional stake in the space program. Implicit in this was the potential for a citizens lobby for space, of the kind that was emerging around other issues in the late 1960s and early 1970s. However, this potential pro-space movement was, as science fact/science fiction writer G. Harry Stine says, “totally unorganized” in that turning point year of 1972. Homer E. Newell illuminated the problem when he wrote that “NASA had enjoyed a strong followership.”  Many ordinary Americans were excited about space, but they were not organized to express themselves as an interest group and to make their influence felt, nor was there a consensus about what they should do. The pro-space movement of the 1970s came not from one initiative but from the intertwining of many threads. Stine recalls an event that characterized the situation in the early 1970s, a gathering he calls the “Ship of Fools” expedition. Noting that the Apollo 17 mission of December 1972 would be the last journey to the Moon for the foreseeable future, science writer Richard Hoagland organized a voyage on the SS Statendam to observe the launch from offshore (Hoagland was to appear again in the role of an organizational entrepreneur in the pro-space field.) On board, invited speakers, including writers and prominent space buffs, participated in a symposium chaired by television personality Hugh Downs, who later became president of the National Space Institute. They included science fiction writers Isaac Asimov and Ben Bova. (Katherine Anne Porter, author of The Ship of Fools, also was present.) Writer Norman Mailer, who regarded our expansion into space as “profoundly ambiguous,” never­theless said he believed in the necessity for humans to voyage into space because, “I think it is part of our human design, part of our inner imperative.” While many of those present expressed concern about the future of the space program, there was no consensus as to what should be done. However, says Stine, it was recognized that “politics” had failed and that the existing organizations were not doing the job. The “Ship of Fools” expedition reflected a broader sense that action was needed to keep the space dream alive. It was that vague, inchoate, but shared feeling that provided the constituency for the new pro-space movement. Jesco von Puttkamer, a NASA planner who has had an on-and-off relationship with pro-space organizations over the years, traces the origins of the pro-space movement back to the creation of the Alabama Space and Rocket Center (ASRC) in Huntsville, Alabama, in the late 1960s. Wernher von Braun, then based at the Marshall Space Flight Center in Huntsville, lobbied the government of Alabama successfully for funding for the ASRC, which was intended to communicate the excitement and promise of space to the public. The ASRC has been a success, attracting many visitors. In 1981, as the Space Shuttle began its journeys into space, the ASRC established a Space Camp for young people that has proven to be extremely popular, attracting 2,630 boys and girls in 1984. There have been other space-oriented museums since, notably the National Air and Space Museum in Washington, D.C., which opened in July 1976. Although these may have been stimuli to some of the founders of pro-space groups, the origins of the movement appear to lie elsewhere. In organizational terms, it appears that the forerunner of the new pro-space movement was a small, highly idealistic group called the Committee for the Future (CFF). Although it never had much influence, the CFF enunciated many of the themes taken up by other pro-space individuals and organizations in the middle and late 1970s. Possibly we were witnessing the natural diversification of the species at this phase, to meet the requirement for some to be attracted to new and vital tasks of nurturing, tending, and bringing harmony to Earth — what Teilhard de Chardin calls “the agents of planetisation — the builders of the Earth,” and for some to be attracted to going beyond Earth to build new worlds, and be transformed into new beings — extraterrestrials and new terrestrials — builders of new heavens and a new Earth: new worlds on Earth, new worlds in space. July 20, 1969, the date of the first landing of men on the Moon, also was the publication date for Earl’s book The Search is On. In it he argued that it is time for men to move toward goals beyond material abundance. We must want to build a future for all mankind, he argued, by exploring the universe and developing new worlds. In September 1969, the Hubbards discovered a fellow believer in Colonel John Whiteside, then the chief U.S. Air Force information officer in New York City. Whiteside had been a USAF Public Affairs Officer during Project Mercury. By the next year, Earl and Barbara had decided that the goal to establish the first “space community” should be announced in 1976. Earth-bound history has ended. Universal history has begun. Mankind has been born into an environment of immeasurable possibilities. We, the Committee for the Future, believe that the long-range goal for Mankind should be to seek and settle new worlds. To survive and realize the common aspiration of all people for a future of unlimited opportunity, this generation must begin now to find the means of converting the planets into life support systems for the race of Man. In the charter it was declared that the development of new worlds will provide a basis for curing Earthly unemployment and offer a basis for a meaningful union of the peoples of the world. “A challenge of this magnitude,” says the charter, “can emancipate the genius of Man.” The CFF began putting out a publication called New Worlds Review. In the fall of 1970, Los Angeles film producer George van Vallcenberg pointed out to the Hubbards that two Saturn V rockets would be left over from the Apollo program. The CFF leaders realized that they could initiate the first “citizen-sponsored lunar expedition,” which could pay for itself through the sale of lunar materials and through television and story rights; there could be a general subscription to let the public participate in financing the project. This came to be known as Project Harvest Moon. The CFF formed the New Worlds Company in January 1971 with the help of $25,000 from Barbara’s father. The purpose was to rally support for the next great goal: a lunar community. This would help generate popular pressure for the funding of the necessary intermediate steps such as the Space Shuttle — a theme taken up by others 13 years later. Through the offering of shares in the lunar enterprise to millions of people, a constituency with a vested interest in the development of the Moon and outer space activities would be created. The Hubbards clearly saw the Moon as a place where resources could be mined. In May 1971, the CFF held a conference on “Mankind and the Universe” at Southern Illinois University, the alma mater of Colonel Whiteside. This followed up on conferences at Lakeville with students from the university. Speakers included Buckminster Fuller and other futurists. By then, Barbara, who had access to many important people, was beginning to emerge as more of a spokesperson for the CFF vision than her husband. The CFF held a series of subsequent conferences in different American cities and even in a foreign country. Colonel Whiteside came up with the idea of a large, wheel-shaped structure that housed the conference; walls between sections were removed in stages, until all participants came together in what came to be known as a “synergistic convergence,” or SYNCON. Two SYNCONs were held in Los Angeles; a participant recalls that one was addressed by science fiction writer Ray Bradbury, “Star Trek” creator Gene Roddenberry, and others, and that the Robert Wagner Chorale sang a “Space Madrigal.” He adds that this enterprise attracted what he calls “space gypsies,” young volunteers who followed SYNCON around the country. Meanwhile, things were changing in the CFF, which moved its headquarters to Philadelphia. Its emphasis began to shift away from space and toward other issues. A gap grew between Barbara and Earl, who separated. Although Earl gradually dropped out of the CFF, he went on to publish another book called The Need for New Worlds, which elaborated on themes in his earlier work. Although Colonel Whiteside has since died, Barbara has remained intermittently active in the pro-space cause. When the Reagan administration took office in January 1981, she wrote to Vice-President Bush, urging that the Space Council be reestablished with Bush as its head and enclosed a 20-year space plan by former NASA Administrator Thomas O. Paine. An early donor to the World Future Society and later a member of its board, she also has remained a prominent figure in the futurist field, at one time heading a Futures Network. As of 1984, she still was a regular speaker at the World Future Society’s conventions. In 1982, she published a book entitled The Evolutionary Journey: A Personal Guide to a Positive Future, in which she argued that the human species stands at the threshold of “conscious evolution,” ready to make a quantum leap into a new order as it begins the great evolutionary tasks of restoring the Earth, freeing people from want, developing physical and mental potentialities, and exploring outer space. As of the spring of 1984, she was the head of an organization known as the Campaign for a Positive Future and was running for the Democratic Vice-Presidential nomination. For all its good intentions, the CFF suffered from a lack of technical expertise and credibility. Critics regarded it as “flaky,” and most people in the space field did not take it seriously. It never reached the “critical mass” to become a real organization that could carry out a long-term program or lobby systematically for a cause. Alan Ladwig, a student at Southern Illinois University who was involved in the early CFF conferences, went on to head a “space-sympathetic” organization, and later to work for NASA, observes that the CFF got many people, particularly young ones, involved temporarily, but adds that there was no mechanism to keep people involved. To William S. Bainbridge, the history of the CFF suggested that there was little or no opportunity for amateurs to participate in furthering the exploration, exploitation, and colonization of the solar system. Yet the CFF was a harbinger in many ways, particularly in its efforts to project a broad, positive vision of the future that fully incorporated the spaceflight revolution, and to involve ordinary citizens in the pro-space cause. Another strain in the new pro-space movement came from young people with a serious interest in aerospace technology. In September 1970, Professor Wilbur Nelson at the University of Michigan saw that the project to build an American supersonic transport (SST) was in political trouble and brought together a group of aerospace engineering students who supported the project. A politically oriented student named David Fradin formed an organization in January 1971 called Fly America’s Supersonic Transport (FASST), which shared an office with the campus Gilbert and Sullivan Society. Another active early member was the bright, aggressive Thomas A. Heppenheimer, later active in advocating space colonization. FASST became a focal point for a network of pro-technology, pro-space young people. Although clearly out of tune with the anti-big technology trend of the time, FASST collected about 3,000 signatures on a pro-SST petition at the University of Michigan. In March 1971, Heppenheimer wrote and Fradin delivered pro-SST testimony before the Subcommittee on Transportation of the House Appropriations Committee. The SST was cancelled anyway, leaving the organization without a role. FASST regrouped and changed its name to Friends of Aerospace Supporting Science and Technology, broadening its interests as it spread to other campuses. The organization then changed its name to the Federation of Americans Supporting Science and Technology, keeping the acronym. Fradin and Heppenheimer testified before Congressman Don Fuqua’s House Subcommittee on Manned Spaceflight in March 1972, with Fradin warning that “this country’s respect for science and technology is changing to contempt, and, as a result, the technology required to solve global problems may never be developed.” FASST also supported the then embattled Space Shuttle, writing to Senator Walter Mondale in February 1972. The organization then described itself as being dedicated to the concepts of international stability, a clean environment, and social progress through science and technology. FASST moved its headquarters to Columbia, Maryland, in the fall of 1973 and succeeded in getting seed money for the Energy Youth Council from the Atomic Energy Commission and energy companies. FASST moved to downtown Washington in the spring of 1974. Fradin and Heppenheimer left the organization, and Alan Ladwig became its new leader at the end of that year. FASST also hired the young California space enthusiast Leonard W. David to help with space issues, including an assessment of student support for the space program. By the end of 1975, the organization had about 400 members and 20 active chapters on college campuses, and its staff had grown from two to seven. The organization changed its name to Forum for the Advancement of Students in Science and Technology late in 1975. Wanting to improve understanding of science and technology issues and to raise the level of debate on them, FASST made a conscious effort to make a connection between science and technology students and public policy. The new FASST got grants from NASA, the Energy Research and Development Administration, and companies to put on programs designed to involve students in the discussion of science and technology interests (as Ladwig comments, “people then took students seriously”). FASST organized two White House conferences in 1975. FASST retained a strong interest in space, helping to create the Shuttle Student Involvement Project in cooperation with NASA and the National Science Teachers Association and sponsoring or cosponsoring meetings related to space. The organization also had a contract to study student involvement in the satellite solar power station project (see Chapter 4). However, financial stringency forced a reduction in staff, eventually leaving Ladwig and David as the only officers of the organization. FASST finally folded in December 1980, a victim of changing times; the sense of emergency about youth attitudes toward science and technology had passed. Ladwig and David were not done with space. As of 1985, Ladwig was the manager of NASA’s Spaceflight Participants Program, which will choose private citizens to go into space. It is difficult to imagine a more perfect location for a member of a movement that wants to increase public access to space and broaden participation in the space enterprise. Leonard David, who remembers being called “crater eyes” by his school chums because of his interest in amateur astronomy, became the editor of the National Space Institute’s newsletter Insight, and in 1984 he became editor of Space World, a previously existing magazine now published in cooperation with the National Space Institute. 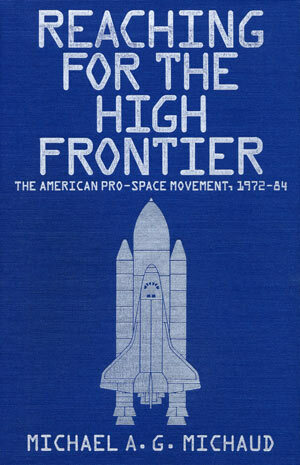 The early 1970s also saw the founding of the oldest still existing American “grass-roots” pro-space citizens organization with more than local membership. In 1973, two high school students in Elizabethtown, Pennsylvania — Stephen M. Cobaugh and John K. Alleman — got together to form the Lancaster County Space Education Association, largely in response to waning public interest in the space program. This became the United States Space Education Association in 1975. Describing itself as the first organization to educate the public on the benefits of space exploration, the USSEA grew to have hundreds of members, began publishing Space Age Times, and began putting on exhibits and other educational functions related to space. Although the USSEA remains small, it has survived because of the continuing enthusiasm of its original leaders. In its own words, the USSEA “established an early model for the pro-space movement through an integration of educational and news gathering techniques. The USSEA demonstrated the capabilities of grassroots involvement in public space policy decision-making.” The congressman representing that part of Pennsylvania in the early 1980s, Republican Robert Walker, is outspokenly pro-space. The first large, national pro-space citizens organization of the new era came from different origins. As the fortunes of the civil space program declined in the late 1960s and early 1970s, some of the leading government and industry figures in Washington’s space community became increasingly concerned about the lack of a broad-based, “grass-roots” support organization for space. NASA officials discussed the problem with Washington representatives of interested companies who were members of the National Space Club. According to Neil Ruzic, a publisher of technical magazines who was involved in these discussions, NASA wanted something like a Navy League for space. But NASA itself could not organize a citizens group to support its own program. In May 1973 (the month when Skylab went into orbit), past National Space Club President Gene Bradley, a Boeing Company executive, recommended to the club’s executive committee that the club expand its activities to the national level, encompassing tens to hundreds of thousands of members. Then Club President Tom Emerich, of Martin Marietta Corporation, appointed a committee chaired by Bradley to investigate the feasibility of this idea. Subsequently, Fairchild Industries Vice-President Tom Turner developed a program plan for the creation of a National Space Association, which he presented to the club’s executive committee in May 1974. The new president of the club, Fred Everett of Westinghouse Electric, appointed Harry S. (Terry) Dawson, Jr. of System Planning Corporation to head a committee that would study the plan. The Dawson Committee reported that the club should support the creation of a National Space Association but that serious financial risks would be incurred if the activities of the two organizations were merged. As a result, an independent National Space Association was incorporated in June 1974. All of those who signed the incorporation papers were past officers of the National Space Club and were employed by corporations with interests in the space field. According to Dawson, who in 1984 was on the staff of the House Subcommittee on Space Science and Technology, the new association was to be a National Geographic type of society, complete with a quality monthly magazine. The original goal was to reach 100,000 members plus 100 corporate members within three years. The founders saw the new association as a “buffer” between government and public, which would tell citizens how space programs benefit them and get public views to the government. The main purposes in its articles of incorporation were to promote U.S. space leadership, to stimulate the advancement of civilian and military applications of space and related technologies, to bring people together for the exchange of information and through them to inform the public, and to provide recognition to individuals and organizations that have contributed to the advancement of space. The National Space Association needed a big name to attract attention and help with fund-raising. Tom Turner approached Wernher von Braun, then with Fairchild Industries, and von Braun became president of the National Space Association in August 1974. Retired rocket engineer Frederick C. Durant III, who calls von Braun “the greatest salesman for space this country has ever had,” says von Braun described the new organization as his “retirement project.” Four months later, the association hired as its first executive director Charles Hewitt, a man with organizational and fund-raising experience but no space background. Von Braun and Hewitt traveled around the United States to raise funds from aerospace companies. Encountering resistance to the idea of giving to “another association,” they recommended that the name be changed; in April 1975, the association became the National Space Institute. We believe that there is a need to provide the public with a voice in the direction of the space program. Properly directed and supported, the space projects planned for the future can be designed to help resolve many of our pressing energy, food, environmental, and economic problems…. I also believe that the much heralded idea of the Earth as a limited planet is absolutely unacceptable…. I am certain that future generations will say that the real significance in our space program lay in the fact that it took the lid off the limitations posed by the finite size and the finite resources of the planet Earth. For we are no longer limited to just one planet, Earth. We have all the mineral resources and all the energies of the solar system at our disposal, and maybe one day we will even go beyond that. Unfortunately for NSI, von Braun’s declining health prevented him from devoting his full energies to the new organization; in 1976 he gave up the presidency to Hugh Downs. Von Braun’s death in June 1977 was a serious blow for the institute, whose fund raising had never reached the critical mass necessary for exponential growth. Meanwhile, astronomer Carl Sagan was approached to see if he would be willing to join the board. Sagan reportedly expressed interest but only on the conditions that more scientists be put on the board and that NSI take a broader view of space than the manned spaceflight program. Sagan, with Bruce Murray, later created his own organization — the Planetary Society. The NSI was rescued financially in 1977 by a large influx of money from the settlement of a dispute between the International Association of Machinists and Aerospace Workers and United Technologies Corporation. Union leader William Winpisinger, a member of the NSI Board, got the agreement of UTC Chairman Harry Gray that about $900,000 of the settlement could be paid to the NSI. The institute used much of this money to run a direct mail campaign that increased its membership to an all-time high of 22,000. However, the ideal NSI magazine remained out of reach; members were served with a modest newsletter edited first by Julie Forbush, who went on to try something similar at the National Air and Space Museum, then by the young space activist Courtney Stadd, later active with one of the new launch vehicle companies. When Hewitt left the NSI in 1980, Stadd became acting manager of the organization and Leonard David of FASST became part-time editor. Neil Ruzic had hoped that the institute would invest enough in a high-quality magazine from the beginning to make it self-funding, allowing NSI to use its funds for other things, even its own space projects, but this never worked out. In 1978 Ruzic suggested a linkage between NSI and the new science fact/science fiction magazine Omni. Under the short-lived arrangement, Omni conducted a direct mail campaign for a package deal that included a subscription to the magazine along with membership in NSI. According to Ruzic, this promotion brought in 10,000 to 15,000 new members. However, this arrangement ended after a year, at least in part because the NSI was losing money on it. Subsequently, the NSI worked out a cooperative arrangement with the established magazine Space World, which included the NSI newsletter beginning in 1982. In 1984, NSI’s Leonard David replaced Huntsville space journalist David Dooling as editor of that magazine. Hewitt was replaced in 1980 by Mark R. Chartrand III, former Director of Education and later chairman of the Hayden Planetarium in New York City, and a writer of science articles for publications including Omni. Under Chartrand, the NSI gave greater emphasis to its educational activities, such as regional meetings and conferences intended to involve members. The NSI also has organized tours to space launches from Kennedy Space Center in Florida. Perhaps the NSI’s best-known program was the “Dial-a-Shuttle” arrangement launched in 1983 under the direction of Bonny Lee Michaelson, through which people can listen in on communications between astronauts and mission control by dialing a special number. Over 800,000 calls were placed to that number during one of the early Shuttle flights. Since 1983, the NSI has testified each year before the House Subcommittee on Space Science and Applications, the only pro-space citizens group that is regularly invited to do so. Ben Bova, who became president of NSI in 1983 after publishing the pro-space and pro-technology book The High Road, believes that one of the NSI’s major accomplishments has been to act as the voice of the people in these hearings. “It is the only broad, pro-space group to tell Congress what its members are thinking,” he says. Both NSI officers and congressional staffers agree that the NSI does no real lobbying on Capitol Hill. Chartrand says that the NSI’s contacts are with congressional staffers, not members, and that its highest level contact in the administration is the President’s science advisor. The NSI did show some sign of activism in 1981 when it appeared that the Reagan administration’s budget cuts might threaten the space program. A letter from Chartrand asked members to call the White House opinion number and to write President Reagan and suggested some arguments to use. As of 1984, the NSI was just holding its own in terms of members, having about 11,000 at the end of 1983. It has continued to rely on periodic appeals to corporations for donations. At the end of 1983, a reorganization moved new names onto the board, including former astronaut Frank Borman (Chairman of Eastern Airlines), House Science and Technology Committee Chairman Don Fuqua, actress Nichelle Nichols (who played Lieutenant Uhura in Star Trek), and space artist Robert McCall, who painted a huge space mural in the Smithsonian Institution’s National Air and Space Museum. Mark Chartrand resigned as of March 1984. Glen Wilson, long-time staffer of the old Senate Committee on Aeronautical and Space Sciences and later director of NASA’s academic programs, became executive director later that year. The NSI achieved a milestone in 1984 when Space Shuttle payload specialist Charles Walker became the first NSI member to go into space. In June 1984, the NSI was given a tremendous boost when President Reagan announced that the institute would work with NASA to develop the Young Astronaut program, which is part of “Operation Liftoff,” an effort to encourage young people to study science and technology. However, by the end of 1984 it looked as if the Young Astronaut Program was entirely independent of NSI. As the first major example of the new pro-space citizens groups, the NSI was setting precedents. Under the scrutiny of hopeful pro-space people, it had to deal with a series of issues that faced later groups as well. Given its status as a nonprofit educational institution under section 501(c)3 of the Internal Revenue Act, how aggressive could it be in lobbying? Should a citizens organization depend on donations from industry? Should a pro-space organization follow the staff model (as the NSI basically did) or the grass-roots model? Can one find an executive director who combines the talents of administrator, fund raiser, expert on space, and communicator? The high expectations many attached to the NSI left them disappointed by its performance. There is a widespread feeling in the pro-space community that more could have been done with the unique opportunity the NSI had to mobilize pro-space opinion, possibly turning itself into the single, powerful, pro-space organization some space advocates dream about. Some critics see the NSI as an organization that was created from the top down, rather than from the grass roots, and one designed primarily to serve those already involved with the space program rather than the average space enthusiast. “NSI is a NASA fan club,” says space activist James Muncy, who founded his own small pro-space organization. “NSI was seen as representing the aerospace industry,” comments Planetary Society Executive Director Louis D. Friedman. “They got paid bureaucrats instead of enthusiastic volunteers,” says Hughes Research Laboratory physicist Robert L. Forward, who in 1975 had sent out a circular letter inviting others to join NSI. Ben Bova, who is known to favor a politically more active NSI, recognizes that the institute is seen partly as a monument to von Braun and partly as an industry lap dog. However, Bova points out that “if you support the civil space program, you must support NASA. They have the responsibility of making things work.” It presumably was no coincidence that the NSI, which does support NASA, was chosen to help the Young Astronaut Program. In any case, Bova believes that it never was possible to create a single, unbrella group for pro-space Americans; there is too much diversity in their interests, and there are too many interest group functions to be performed. If NSI had been a grass-roots organization, there would have been no L-5 Society or Spaceweek. If NSI had included planetary exploration, the Planetary Society might not exist. If NSI had done lobbying, there might be no American Space Foundation. Other groups have arisen to fill perceived needs. The NSI may not have lived up to everyone’s expectations, but it did provide the first gathering place at the national level for citizens interested in space. During the early 1970s, the pro-space constituency was still in the early stages of getting organized and had no influence in reversing the downward trend in NASA budgets and aerospace procurement. Despite the gloom among enthusiasts of manned spaceflight, however, inventive people continued to think about how this new environment could be used. Out of this speculation emerged two old but refined concepts that were to prove important in motivating much of the new space movement in the United States: space industrialization and the use of extraterrestrial resources. These ideas can be traced back well before our own time, particularly in science fiction. The man who first put them together in systematic, credible ways, who was the father of both space industrialization and the mining of other celestial bodies, was Krafft A. Ehricke. A member of the German rocket team that included von Braun, Ehricke had even more sweeping visions of the human future in the universe, proposing (among other things) orbiting mirrors to reflect solar energy where it is most needed, the use of nuclear explosives to mine the Moon and the asteroids, lunar industries, and mobile space colonies. Nobody and nothing under the natural laws of this universe imposes any limitations on Man except Man himself. Not only the Earth, but the entire solar system, and as much of the universe as he can reach under the laws of nature, are Man’s rightful field of activity. By expanding through the universe, Man fulfills his destiny as an element of life, endowed with the power of reason and the wisdom of the moral law within himself. This paper set the stage for Ehricke’s concepts of space industrialization, which he came to call “exoindustrialization.” In 1971, he began spelling out in publications his “Extraterrestrial Imperative,” which argued that human expansion into space was both inevitable and desirable, challenging the limits to growth. Specifically, he developed plans for the industrialization and urbanization of the Moon. Sadly for the pro-space cause, Ehricke’s impact on the general public was limited by his heavy, Teutonic style. “A Krafft Ehricke speech is a data dump,” said aerospace engineer Gerald W. Driggers, an admirer of Ehricke’s work who became president of a pro-space organization. Ehricke died in December 1984. The other major figure, also little known outside space circles, was the late Dandridge M. Cole. He, too, was advocating the mining of the asteroids and suggested that some might be hollowed out to become mobile space arks. His 1964 book Islands in Space , written with Donald W. Cox, was the principal statement on space colonization of its time. Meanwhile, other thinkers also contributed to the foundations of space industrialization and the use of extraterrestrial resources. The first practical application foreseen by most advocates was materials processing in space (MPS). American experiments on MPS began in a primitive way in 1968, on the Apollo 8 mission, and were continued on Skylab. Space-processing experiments were flown on rockets beginning with SPAR-1 in 1976. A group of experts at the Marshall Space Flight Center in Huntsville, Alabama, where the presence and influence of the German rocket team were strongest, began developing more specific ideas about space manufacturing. G. Harry Stine, stumbling on these developments in 1971 while researching an article on energy in space, realized that the implications could be revolutionary. In January and February 1973, he published his article “The Third Industrial Revolution” in Analog. This was elaborated into a book, published in 1975. In language that nonexperts could understand, Stine explained that many of the constraints on industrial processes would be removed if factories were located in space, where gravity would be a negligible factor, hard vacuum would be easily available, and waste heat could be dumped into the infinite sink of the Cosmos. There was an environmentalist message as well; by placing our most polluting industries in space, we could protect the Earth while continuing economic growth. Jesco von Puttkamer, who came to Washington in 1974 to help work on a long-term plan for NASA, recalls that the space industrialization concept was developed within NASA during 1975 as an input into the study called Outlook for Space, which was published in 1976. With the drive to realize the classic spaceflight agenda blunted by political realities, NASA planners were looking for an idea that allowed multiple options, and space industrialization fit the bill. The first conference on space industrialization was held in Huntsville in May 1976 under the cosponsorship of the Marshall Space Flight Center, the local AIAA chapter, and the University of Alabama in Huntsville. During that year, NASA commissioned Rockwell International Corporation and Science Applications Incorporated (SAI) to do studies of the prospects for space industrialization. Some of those who worked on those studies were believers in the space dream and were to have strong connections with the citizens space movement; consultants to the Rockwell study included Krafft Ehricke and Barbara Marx Hubbard, and those to the SAI study were almost a “Who’s Who” of American space advocates. To their advocates, these concepts seemed to respond to the worries of the 1970s and to open up new possibilities for the human future. The problem was to sell the new ideas and get support for them. Few of these concepts attracted much public attention. However, they were being circulated within the pro-space community, discussed, reformulated, and made more acceptable. In these ideas lay the potential of earning public and political support for new ventures in space. Most of the people generating these ideas were unknown outside the ranks of space experts and enthusiasts. However one man, Gerard K. O’Neill, created a new synthesis that caught the imagination of a broader section of the public, opening up a major new opportunity for pro-space activity, and sending the pro-space movement off in a new direction. Stephen M. Cobaugh, as quoted in “Speaking of Space: Dynamic Presentations on the New Frontier,” an undated leaflet published by the United States Space Education Association. Homer E. Newell, Beyond the Atmosphere: Early Years of Space Science (Washington, D.C.: National Aeronautics and Space Administration, 1980), p. 295. As quoted in Tom Buckley, “Caribbean Cruise Attempts to Seek Meaning of Apollo,” New York Times, December 12, 1972. Interview with Jesco von Puttkamer, February 28, 1984. See “Teachers Aim High at Space Camp,” New York Times, October 29, 1984. The figure is from an undated (1984) letter from Lee Sentell of the ASRC. Barbara Marx Hubbard, The Hunger of Eve (Harrisburg, Pa.: Stackpole Books, 1976). Earl Hubbard, The Search is On (Los Angeles: Pace, 1969). Hubbard, Hunger of Eve, p. 139. Edward S. Cornish, “A Quest for the Meaning of Life (a review of The Hunger of Eve),” The Futurist, December 1976, pp. 336-45, 340. Hubbard, Hunger of Eve, p. 144. Interview with Alan Ladwig, March 1, 1984. There is a diagram of the SYNCON wheel in William S. Bainbridge, The Spaceflight Revolution (New York: John Wiley & Sons, 1976), p. 173. Earl Hubbard, Our Need for New Worlds (New York: Interbook, 1976). Cornish, “Quest for Meaning of Life,” p. 344. Theodore Taylor, “Strategies for the Future,” Saturday Review World, December 14, 1974, pp. 56-59, 56. Hubbard, Hunger of Eve, p. 129. A copy of this letter is in the files of the Space Coalition, kindly loaned by Leigh Ratiner. Barbara Marx Hubbard, The Evolutionary Journey: A Personal Guide to a Positive Future (Berkeley, Calif.: Mindbody Press, 1985). Bainbridge, Spaceflight Revolution, p. 197. Much of this section is based on interviews with Alan Ladwig, March 1, 1984; Thomas A. Heppenheimer, February 10, 1984; and Leonard W. David, January 23, 1984. University of Michigan News, March 10, 1972. Letter to Senator Walter F. Mondale, February 1, 1972. FASST News, January-February 1976, p. 2. United States Space Education Association release, July 11, 1983, on the organization’s tenth anniversary. “USSEA Milestones,” Space Age Times 10 (July/August 1983):8. Much of this section is based on interviews with Harry S. Dawson, Jr., November 18, 1973, and Neil Ruzic, January 30, 1984. The chronology is from an undated fact sheet entitled “History of the National Space Institute,” kindly provided by Harry S. Dawson, Jr.
Interview with Harry S. Dawson, Jr.
Interview with Frederick C. Durant III, February 29, 1984. National Space Institute Newsletter, November/December, 1975, pp. 2-4. See “840,000 Dialed Columbia’s Phone,” Washington Post, December 10, 1983. Interview with Mark R. Chartrand III, October 11, 1983. Undated letter from Mark R. Chartrand. National Space Institute press release, June 20, 1984. Interview with James Muncy, November 18, 1983. Interview with Louis D. Friedman, February 6, 1984. Interview with Robert L. Forward, February 6, 1984. Interview with Dennis Stone, December 17, 1983. Krafft A. Ehricke, “The Anthropology of Astronautics,” Astronautics 2 (November 1957):26-29, 65-68. Krafft A. Ehricke, “The Extraterrestrial Imperative,” Bulletin of the Atomic Scientists, November 1971, pp. 18-26. An expanded version appeared in the Journal of the British Interplanetary Society 32 (1979):311-17, 410-18. Interview with Gerald W. Driggers, February 13, 1984. Dandridge M. Cole and Donald W. Cox, Islands in Space (New York, Chilton, 1964). See also Dandridge M. Cole, “Extraterrestrial Colonies,” Navigation 7 (Summer-Autumn 1960):86. See news note in Astronomy, February 1977, p. 56. G. Harry Stine, “The Third Industrial Revolution,” Analog, January 1973, pp. 30-45, and Analog, February 1973, pp. 94-115. See also G. Harry Stine, “The Third Industrial Revolution: The Exploitation of the Space Environment,” Spaceflight, September 1974, pp. 327-34. G. Harry Stine, The Third Industrial Revolution (New York: G. Putnam’s Sons, 1975). Outlook for Space: Report to the NASA Administrator by the Outlook for Space Study Group (Washington, D.C.: National Aeronautics and Space Administration, 1976). Space Industrialization Study Final Report, Science Applications Incorporated, April 15, 1978; Space Industrialization Study Final Report, Rockwell International Space Division, April 1978.